The Green Girl ran in her first Cupcake Marathon progressive virtual race. The Cupcake Marathon went from Monday, March 14th through Sunday, March 26th. The requisite 26.2 miles could be run over the course of the two weeks. I started off the Cupcake Marathon with the Run for Christchurch Virtual 5k. As I ran, I reflected on the victims and survivors of the both the Canterbury earthquake last year and the recent Christchurch earthquake. 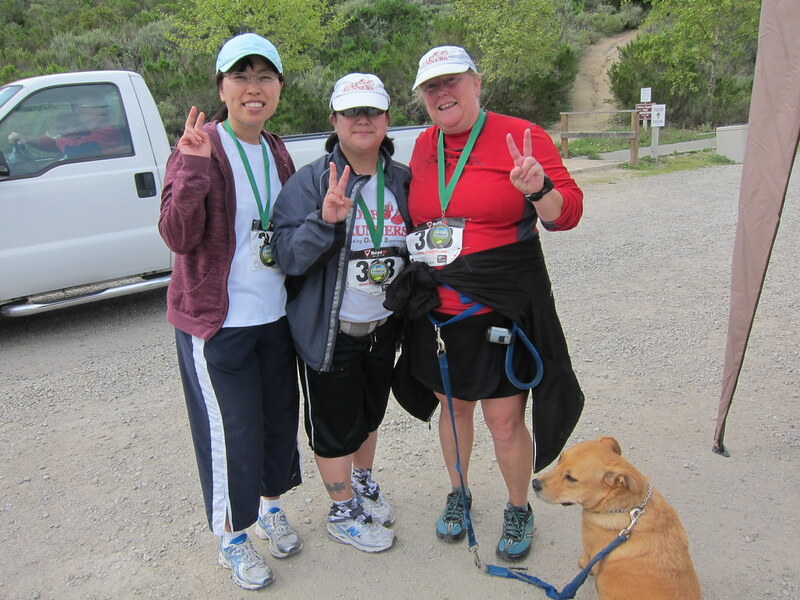 Along with Sole Runners, Barb and Miyuki, I dedicated the St. Patrick's Day Half Marathon to the Run For Japan challenge. Sole Runners dedicating their St. Patrick's Day Half Trail Marathon to Run For Japan. I paid homage to the victims of the earthquake and tsunami as I ran. I thought about how the Japanese culture teaches perseverance with patience and dignity - a philosophy known as gaman がめん. 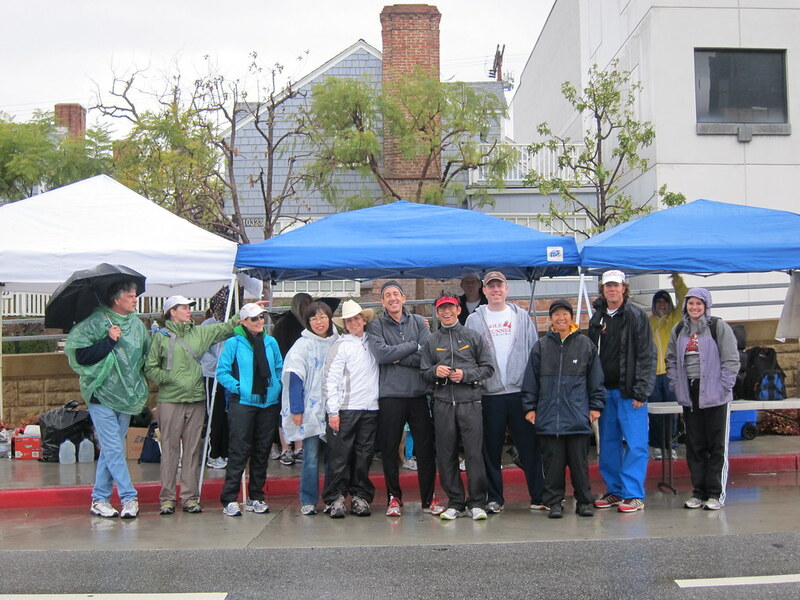 I enjoyed visiting the Run For Japan site and seeing the pictures of all the runners who participated across the globe. 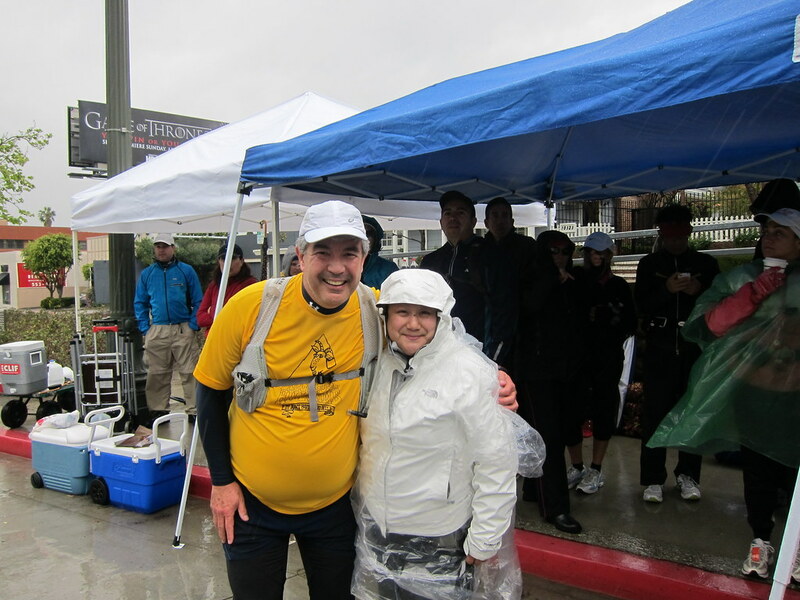 I even managed to squeeze in some mileage from a real marathon when I ran with Jay from Tri2Thrive at the wet and windy LA Marathon from the Sole Runners aide station at Mile 18 to the finish line of his first marathon. I was honored to be able to run with Jay - first marathons are such a special and memorable event. Even I was surprised when the last couple miles of my Cupcake Marathon were on a treadmill at the new gym at my work. 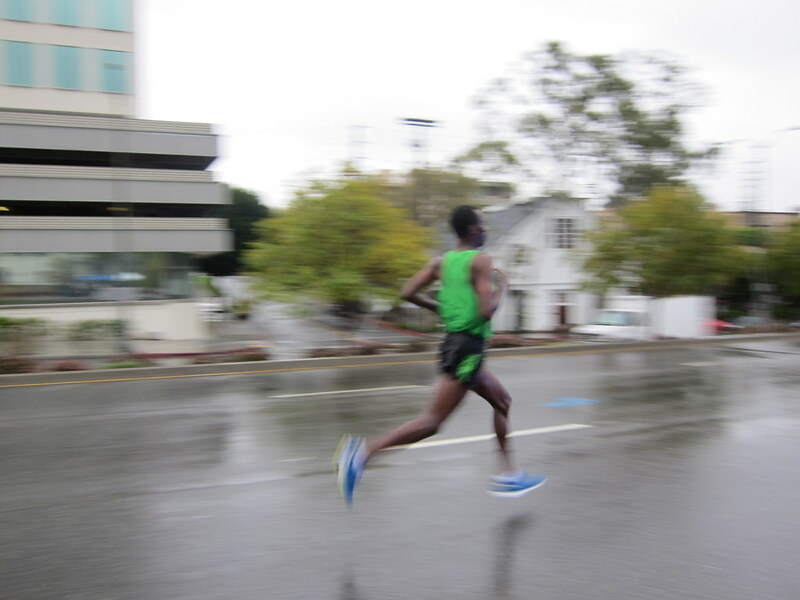 Since Mr. Green Garmin drowned in the LA Marathon rain, I don't know what my official Cupcake Marathon finish time was. Thank you so much to Jason from Cook Train Eat Race and Christel from Silly Girl Running for dreaming up and putting together the Cupcake Marathon! 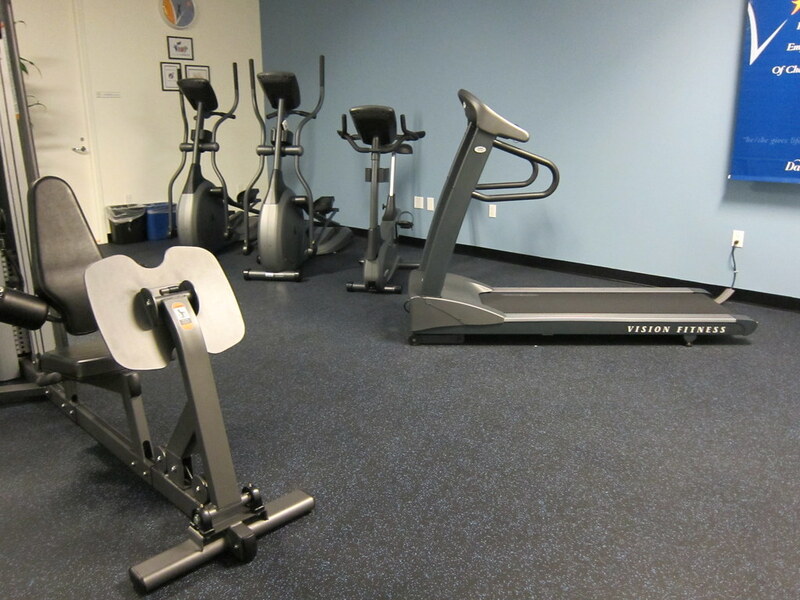 The CasITa-to-5k made its first foray into cross training last week by visiting the newly built gym at work. I am not a fan of gyms but I'd be lying if I said I wasn't thrilled when I heard the announcement. The Playa Gym just celebrated its grand opening. The facility is open 24/7 to all employees at no cost. I was pleasantly surprised by the Playa Gym. 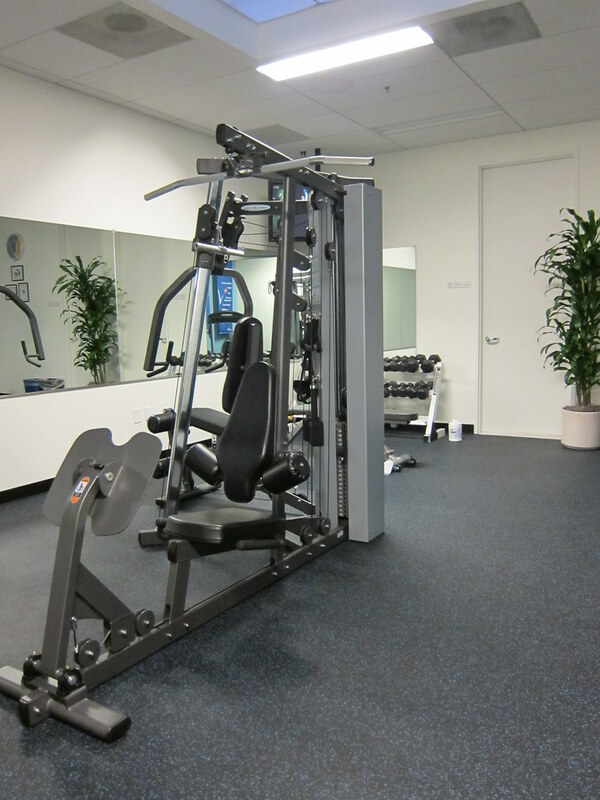 The facility contains a cable station with leg press, a couple of ellipticals, a treadmill, and a stationary bike. 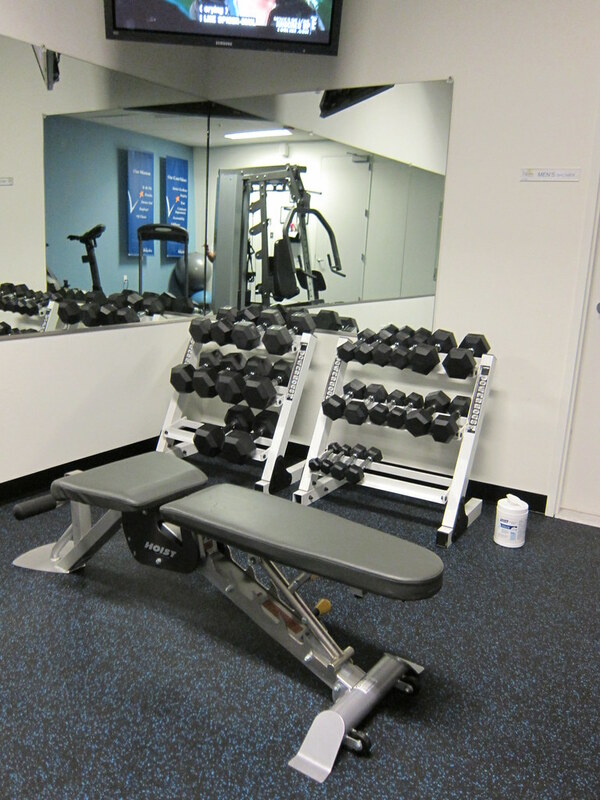 Free weights, a bench, mats, a stability ball, and a Bosu ball are also available. I was pleased to see the cable machine because I've been wanting to integrate some shoulder strengthening into my workouts for awhile now. We started our workout off with some cardio on the elliptical and treadmill. There were two televisions with closed captioning enabled which we watched in between chatting. Towards the back of the Playa Gym, there are changing rooms for men and women complete with lockers and showers. CasITa-to-5k is going to make an effort to hit the gym once a week. I think having workout buddies will help me hold myself accountable. And hopefully, once I get into the habit, it will feel less like a chore and I'll look forward to it like kickboxing and running. We set up the Sole Runners tents across from Century City Mall. After tracking the weather forecast all week, I was one prepared Green Girl. I layered my North Face Venture Raincoat with a disposable poncho. I also tied grocery bags around my ankles to cover my shoes. 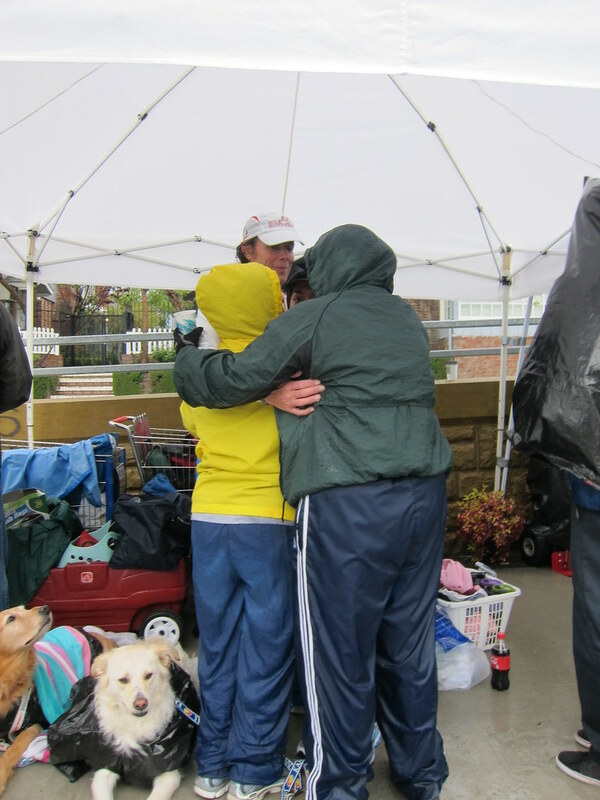 The goal was to stay as warm and dry as possible while waiting for Jay from Tri2Thrive so I could run him in to the finish of his first marathon. Our holistic aide station consisted of water, orange and watermelon slices, pretzels, Trader Joe's Super Red Drink Powder mixed with coconut water, and, of course, The Green Girl's Famous Salted Potatoes. 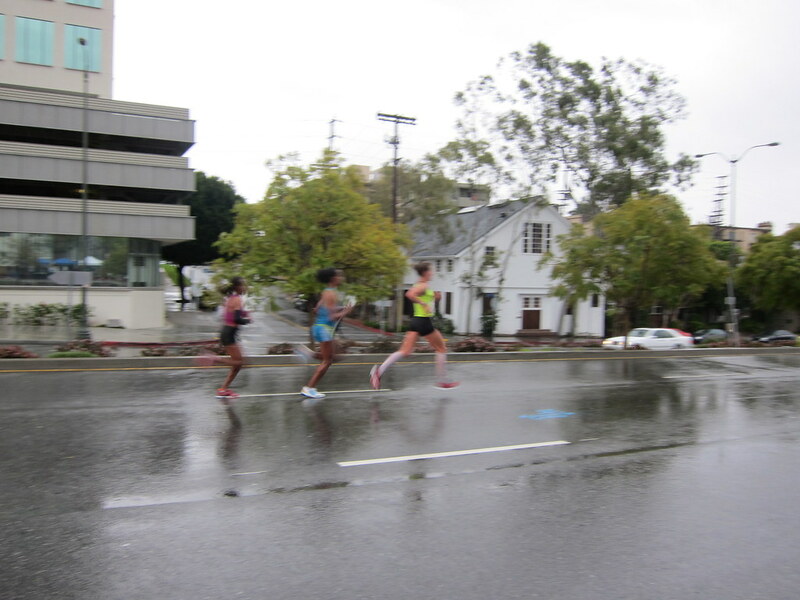 As we were setting up the tables, the first elite women, Mare Dibaba, Buzunesh Deba, and Amy Hastings, ran by. The Sole Runners explained the 17:03 head start the women get to the non-runner volunteers who were surprised to see females in the lead. Shortly after, we saw the first elite man, Markos Geneti. I am fairly certain I'm in the majority when I say watching the elites run by is one of the highlights of being a race volunteer as opposed to a participant. I spotted Glenn from The Running Fat Guy passing by our tent so he stopped to chat. 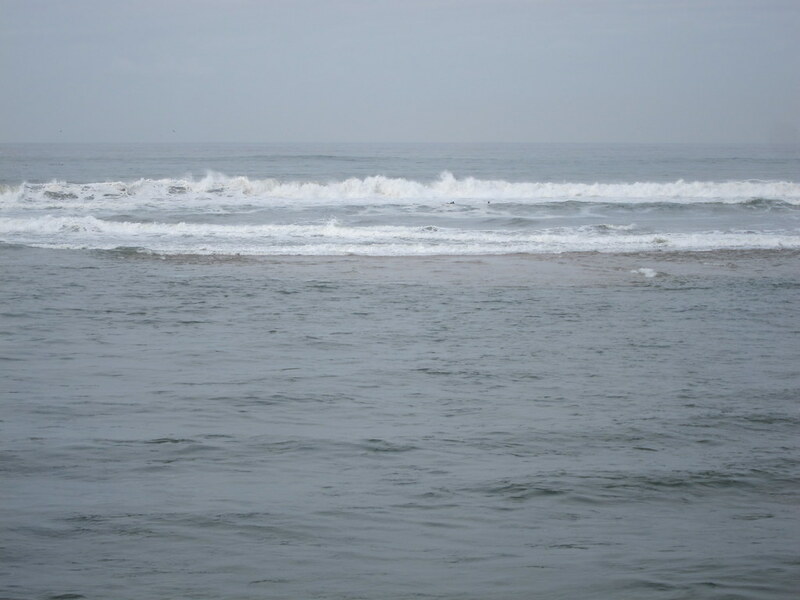 As the race progressed, it was clear hypothermia was a concern. All the Sole Runners did the best we could to make the runners who stopped by our tent as comfortable as possible - Sole Runner or not, we welcomed them. One Sole Runner came through and a couple of other Sole Runners quickly sat her down, gave her some food and drink, and then proceeded to peel off her wet socks and shoes. As she got a breather and some respite from the rain, they coated her feet in BodyGlide and then put on a fresh pair of dry socks and shoes before they sent her on her way. We joked that we were like a Sole Runners pit stop. Another Sole Runner, Mike, made a run to the store to pick up a couple boxes of trash bags and we pre-cut head and arm holes for countless shivering runners. When Jay arrived, he looked strong and appeared to be in good spirits. 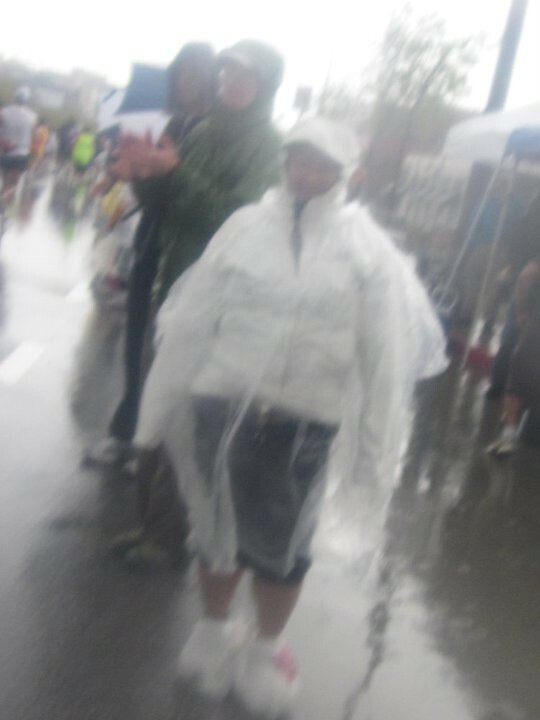 I ripped off my grocery bag shoe protectors and we set off to the Finish Line so he could become a marathoner. On Saturday, the Green Girl dedicated her St. Patrick's Day Trail Half Marathon to the victims and survivors of the Japan earthquake and tsunami by participating in the Run For Japan challenge. 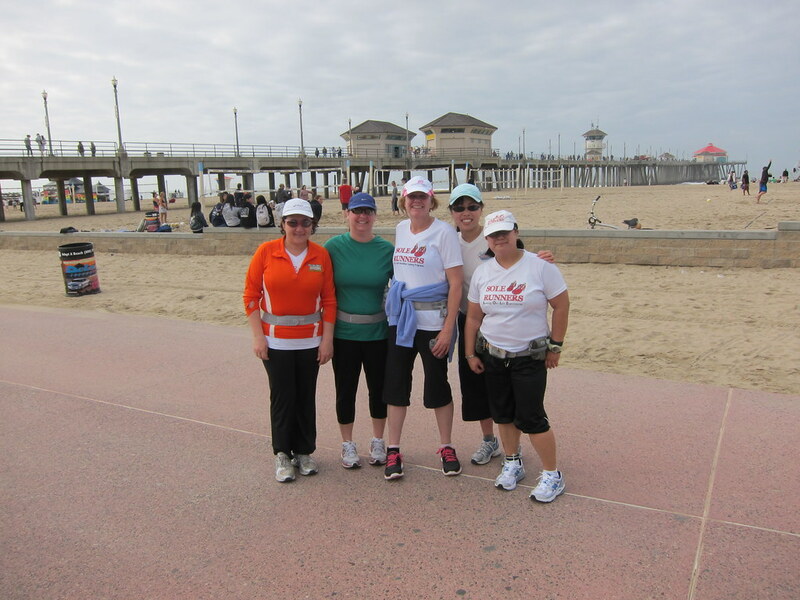 I ran the race with two other Sole Runners, Barb and Miyuki. It was the first time the three of us had run together since the Athens Marathon. 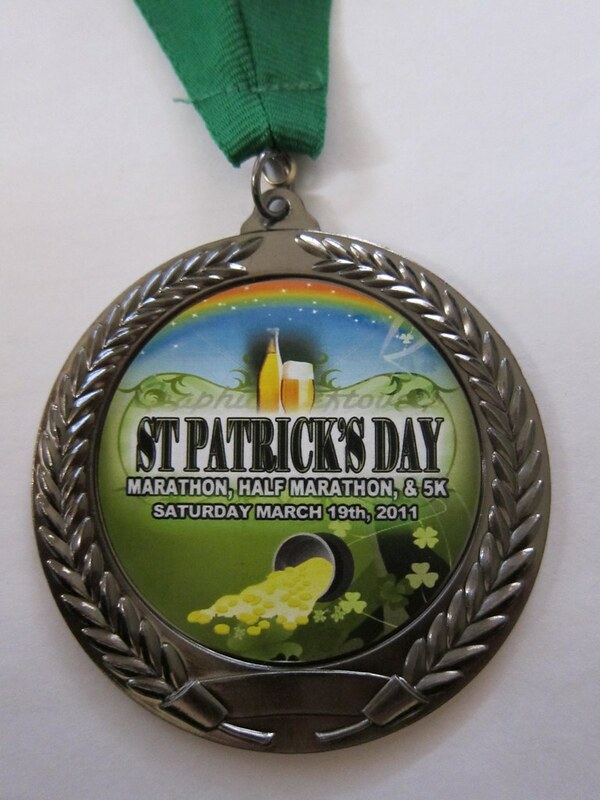 I love low-key races like this St. Patrick's Day Trail Half Marathon because they are fun and hassle-free. 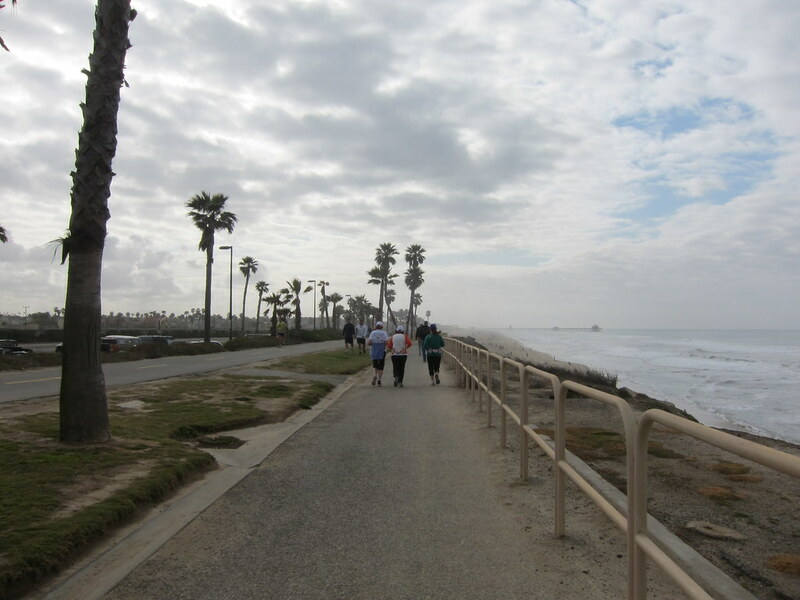 The race started at 7 am so we left Long Beach at 6 am. When we arrived, we chatted with the race director, Charlie, and his wife, Debbie. 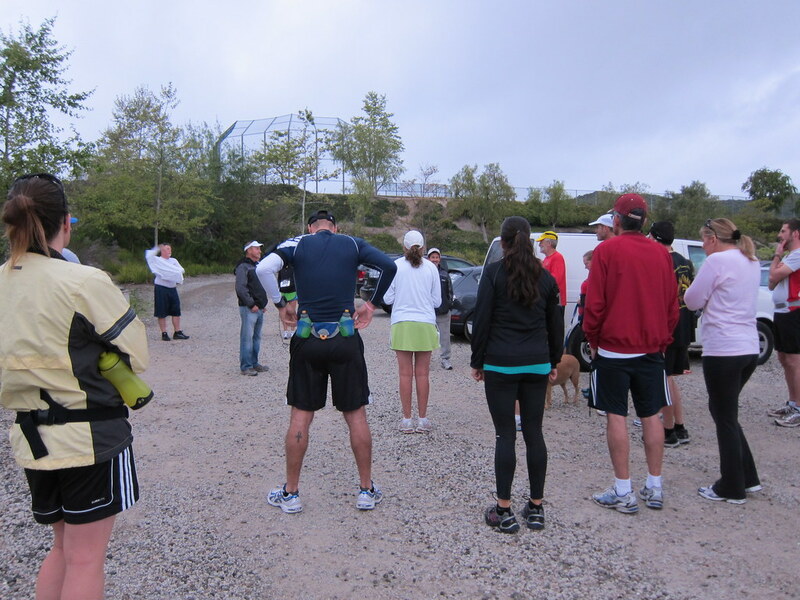 Shortly before the start, the runners gathered around as Charlie gave the race directions. 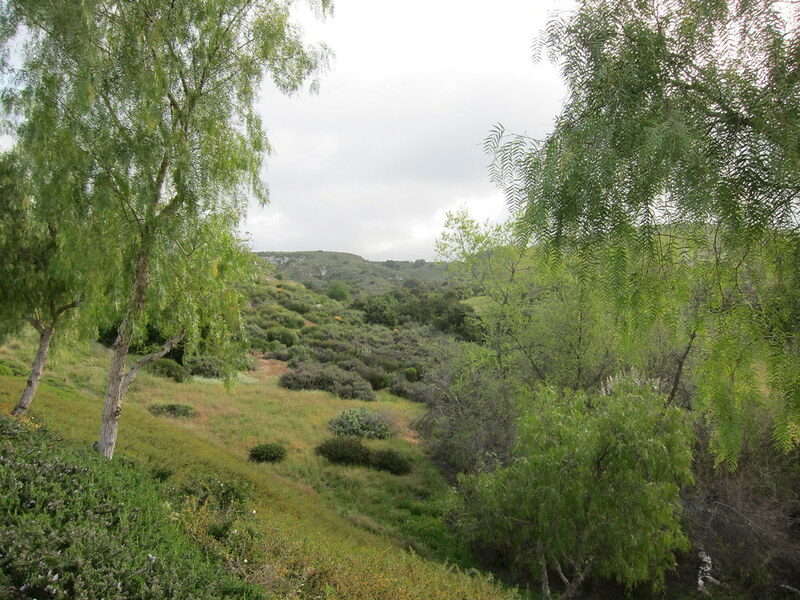 The course was on horse trails in the gated community of Coto de Caza in Orange County. 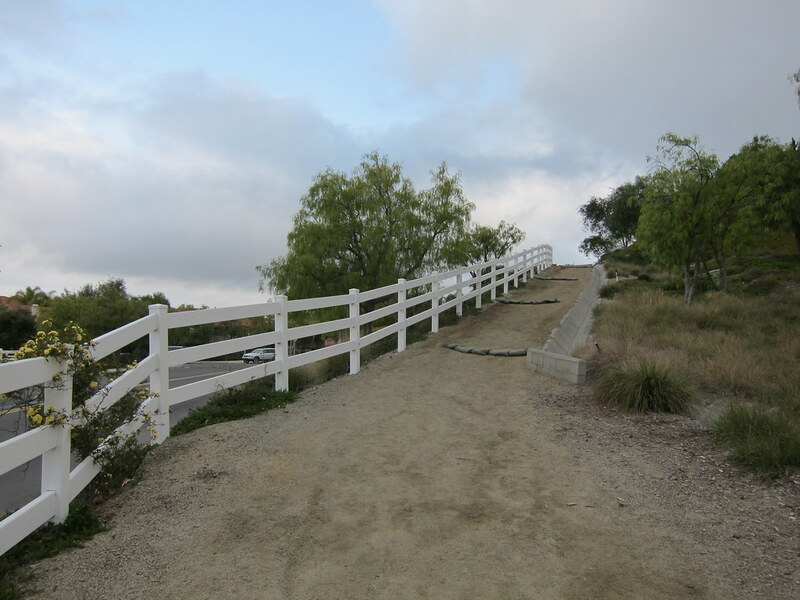 Sandbags were strategically placed across the trail to prevent rain erosion. We leaped over them like mini hurdles. Rain was initially in the forecast but the sky cleared up for us and it was a surprisingly beautiful day. Although it was the final day of Winter, the air was filled with the smells of Spring. We saw a bunny hopping through bushes and ducks congregating beside a man-made pond. As I gazed out over the shades of green carpeting the rolling hills, I reflected on the fragility of our planet. 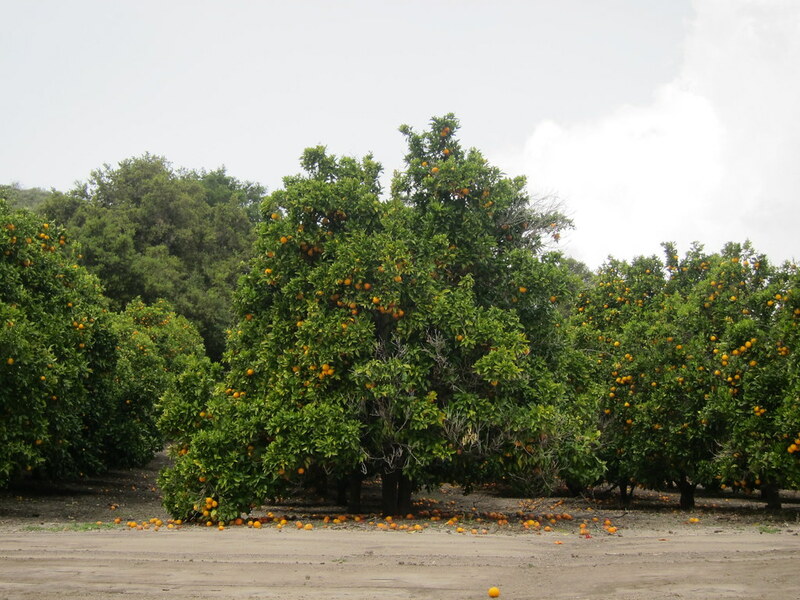 We saw orange trees overflowing with fruit - to the point where the weight had burdened some of the branches to the ground. 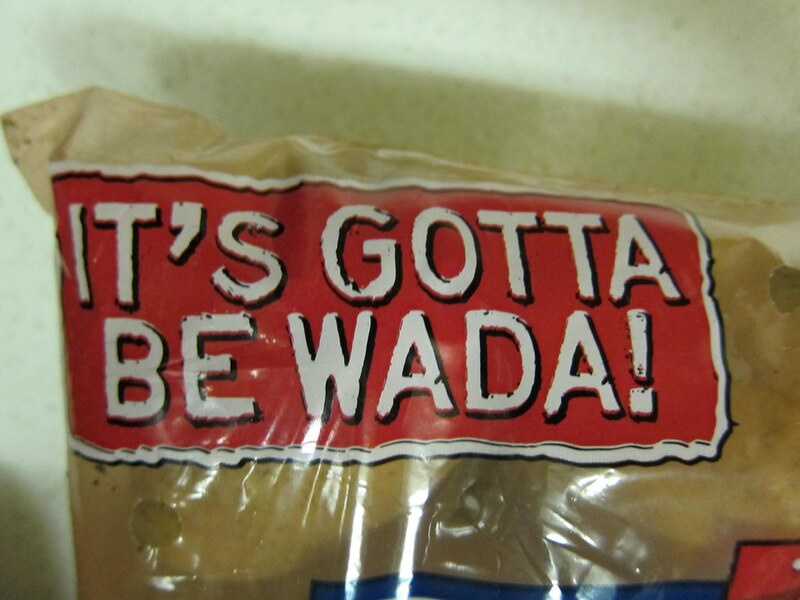 I recalled a Japanese phrase my grandparents would frequently repeat, shikata ga nai 仕方がない. Loosely translated, it means 'there's nothing you can do about it'. To me, this quote exemplifies the Japanese philosophy of gaman がめん. To the Japanese, gaman means perseverance with patience and dignity - no matter how unbearable the circumstances. When I hear of the strength and stoicism of the Japanese people in the aftermath of this devastating event, I am reminded of their gaman. With our run, we paid homage to Japan. 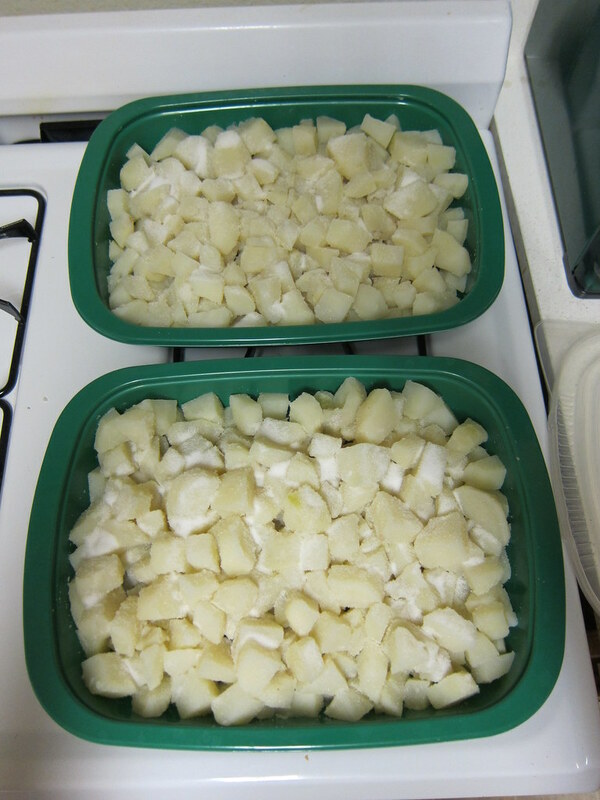 The Green Girl just finished making ten pounds of her Famous Salted Potatoes for the LA Marathon tomorrow. 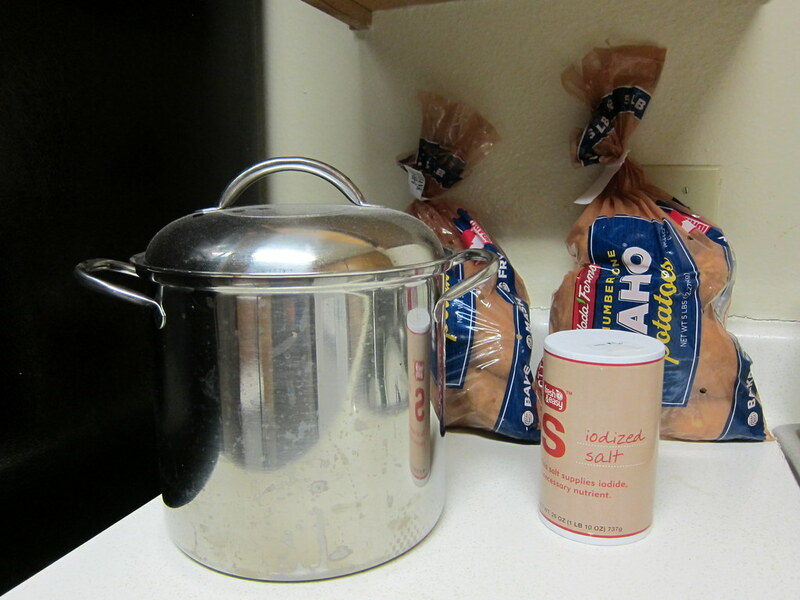 I became famous for my salted potatoes after I made them the Sole Runners Mile 18 aide station last year. The irony of the Green Girl being well known for cooking anything may be lost on those who don't know me but suffice to say, I cannot cook. I actually had to Google 'how to cook potatoes'. Since it worked out well the first time, I boiled the potatoes two nights in advance so they would be cooled and ready to be peeled the night before the race. I was pleased to see the grower of the potatoes, Wada Farms, is a family-owned and operated business in Southeastern Idaho that is dedicated to providing fresh products sustainably. Tomorrow, the Green Girl will be dedicating her St. Patrick's Day Trail Half Marathon to the victims and survivors of the Japan earthquake and tsunami by participating in the Run For Japan challenge. I will be doing this along with two Sole Runners, Barb and Miyuki. Run For Japan's goal is to cover the circumference of the earth, 24,901 miles, in 28 days. Run For Japan is asking runners to dedicate one run to the people of Japan and donate at least one unit of their home currency per mile. The hope is that there will at least one run dedicated from every country in the world. The Green Girl wishes everyone a very happy Green Girl national holiday. 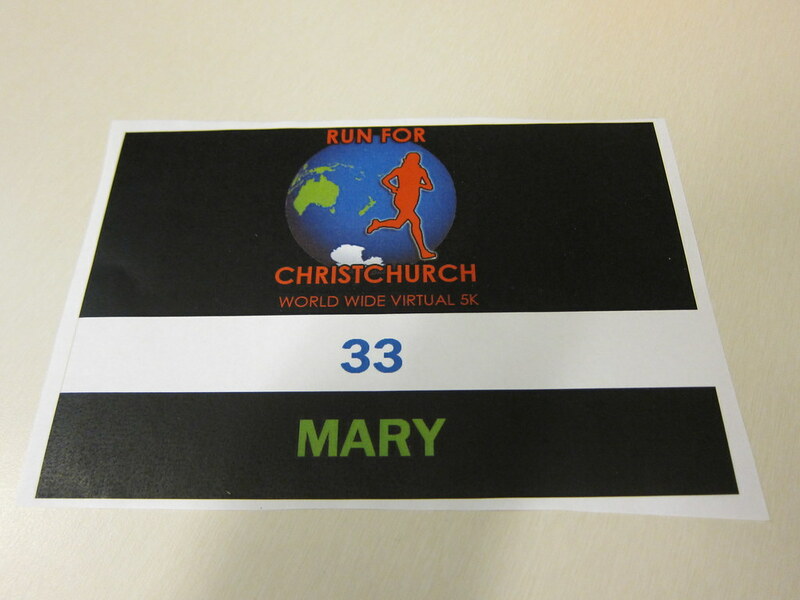 The Green Girl's Run for Christchurch Virtual 5k was a day late due to circumstances beyond the Green Girl's control. I decided I'd would honor Christchurch by watching the sun set on my run. I've always felt like the singularity of the Sun and Moon in relation to the Earth epitomizes the fact that we all inhabitants of the same planet. 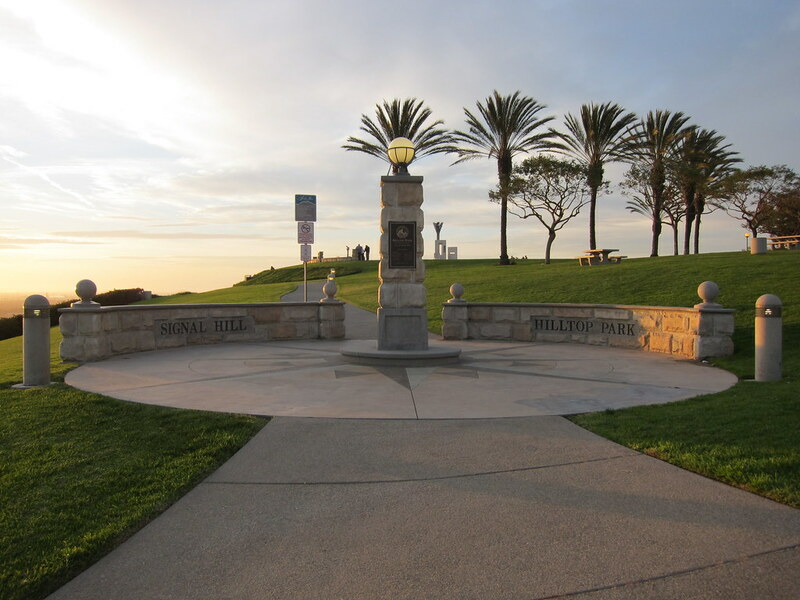 Hilltop Park in Signal Hill is a good place to view the sunset because the location offers a panoramic view of the Los Angeles basin. 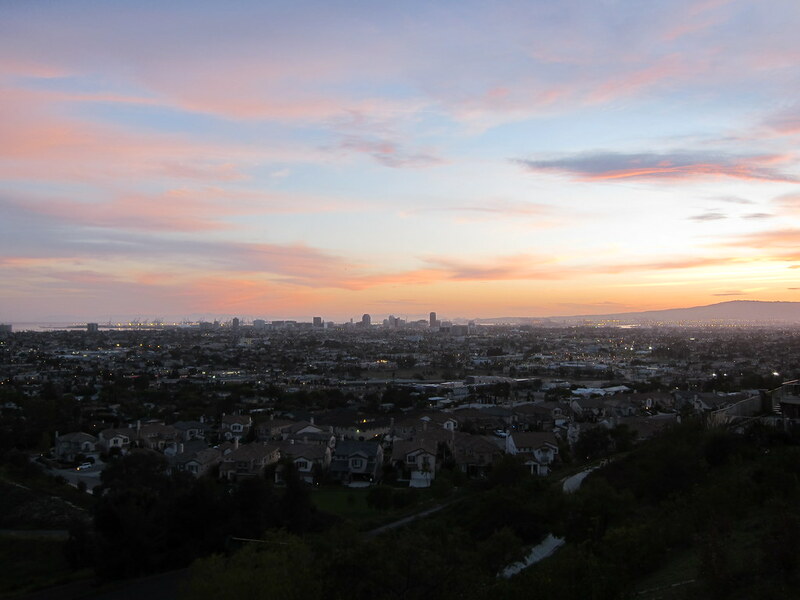 I visited Hilltop Park for an Earth Day Run sunset last year. 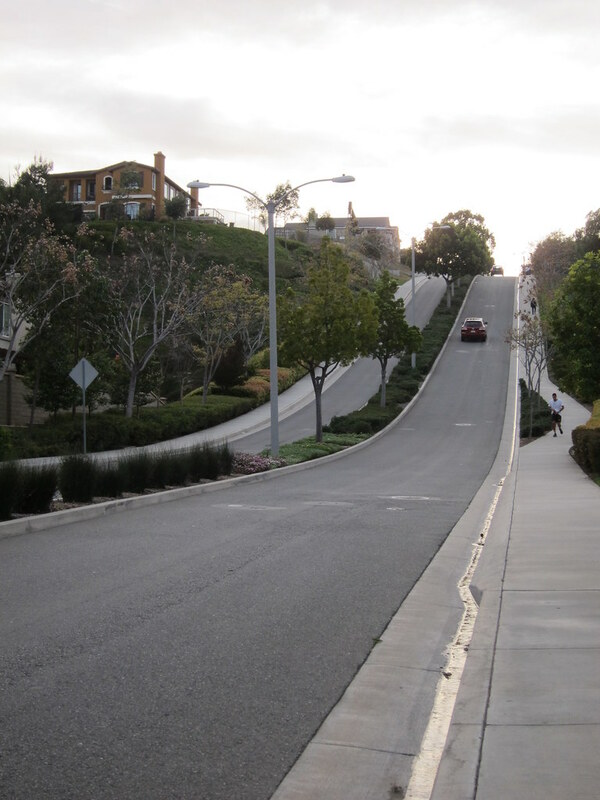 The route started out with a gradual incline and then there was a big hill at Mile 1. This was definitely a challenging 5k. I ran out of steam about halfway up the hill and ended up walking the last quarter of the hill. 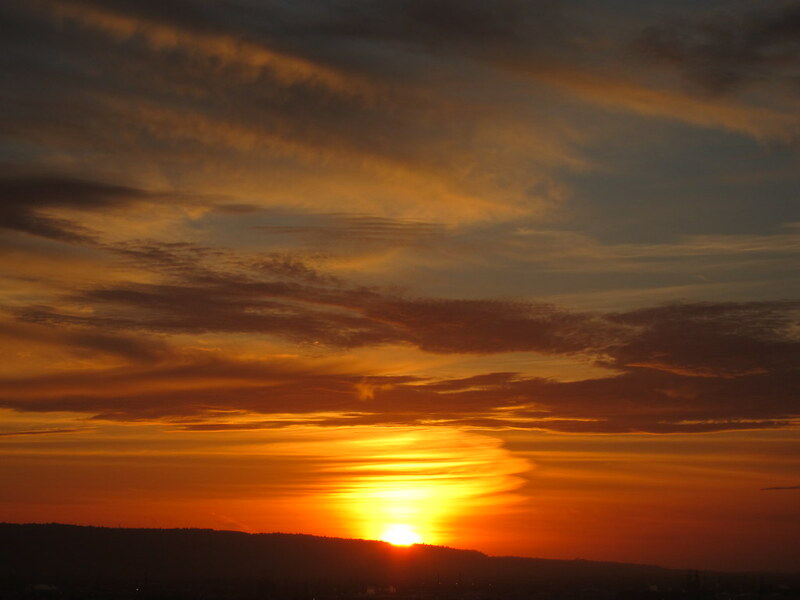 When I reached Hilltop Park, I sat down on the edge of the west side of the park and peered out into the sunset. I thought about my friend, Darren Humphries, and all that he and his family have gone through in such a short period of time. I know that their angel, Elijah, is watching over them. I reflected on the victims and survivors of the both the Canterbury earthquake last year and the recent Christchurch earthquake. The clouds resembled strokes of a paintbrush against the blazing sky. I pondered Mother Nature's power for both creation and destruction. When just a glimmer of the sun's sphere could be seen on the horizon, I continued my run. The Green Girl has nothing but positive things to say about New Balance 1012 motion control shoes. Unfortunately, that injury resulted in posterior tibial tendonitis. For months, I was forced to walk on the side of my foot to avoid excruciating arch pain. I can say with certainty that it was a combination of the exercises for posterior tibial tendonitis, taping my arch, orthotics, and my New Balance 1012's that enabled me to run again. The 1012's were the ideal solution to the New Balance 1123's. The 1123's offered the appropriate level of support but the the high heel counter and flimsy tongue design were annoyances. The 1012 is a very stable shoe. It's bulky - but not as bulky as the 1123. It has a generous toe bed which is perfect for my wide feet. The heel counter is lower so the achilles notch doesn't irritate my ankle. I don't know what I would have done without my 1012's. They have held up my arches through thick and thin. Green Girl Disclaimer: The Green Girl is a huge fan of Jillian Michaels. The Green Girl purchased Jillian Michaels' Banish Fat, Boost Metabolism because, well, who doesn't want to banish fat and boost their metabolism? The DVD consists of a five minute warm-up and cool-down with 40 minutes of circuit training in between. No equipment is required but a mat can be used. All the exercises can be done in a fairly confined space - if you have enough room to lay down and stretch your arms above your head you're good. Jillian starts starts off with her usual dynamic stretching warm-up. Banish Fat, Boost Metabolism consists of seven six-minute circuits. In each circuit, an exercise is performed twice. Jillian seems to favor intervals that involve a lot of jumping. I'm not a huge fan of jumping because I feel like it aggravates my knees. I modified some of the jumping to keep my heart rate up but preserve my knees. She integrates a lot of squatting into this video and I think this could be challenging for beginners. I liked how there was a lot of emphasis on the core throughout the DVD. She mentions how she has a background in kickboxing before she takes you into some jab/cross and jab/cross/hook/elbow combinations. In conclusion, I really like this DVD but I don't think it's geared for beginners. I would recommend it to someone with a solid cardio base who is interested in interval training. It would also be great for travel because you don't need any equipment. The Green Girl managed to squeeze in a rare midday run during her work-from-home lunch hour today. I headed out sans Mr. Green Garmin and allowed my run to be governed by whim. I ran through residential neighborhoods and then weaved over to Recreation Park where I ran around Blair Field. 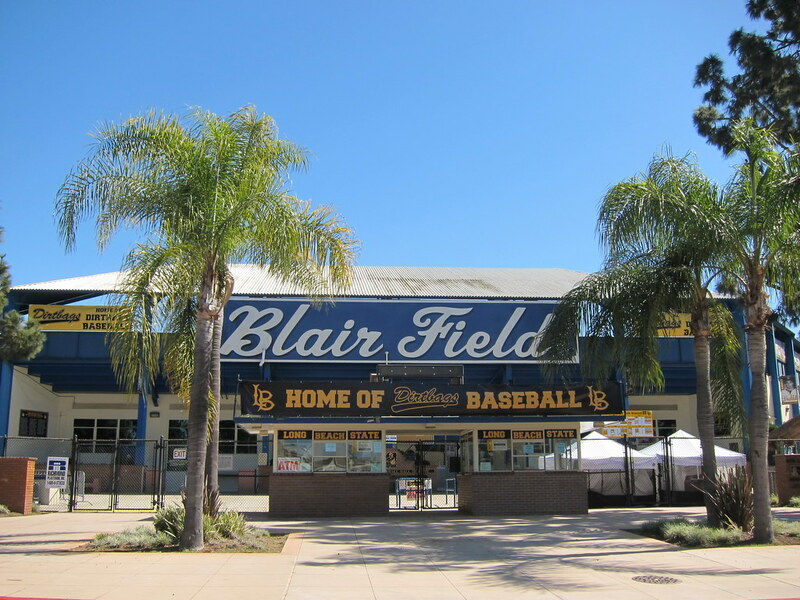 Blair Field was named after the stadium's biggest advocate, Frank T. Blair, a sports editor for the Long Beach Press-Telegram from 1921 to 1953. 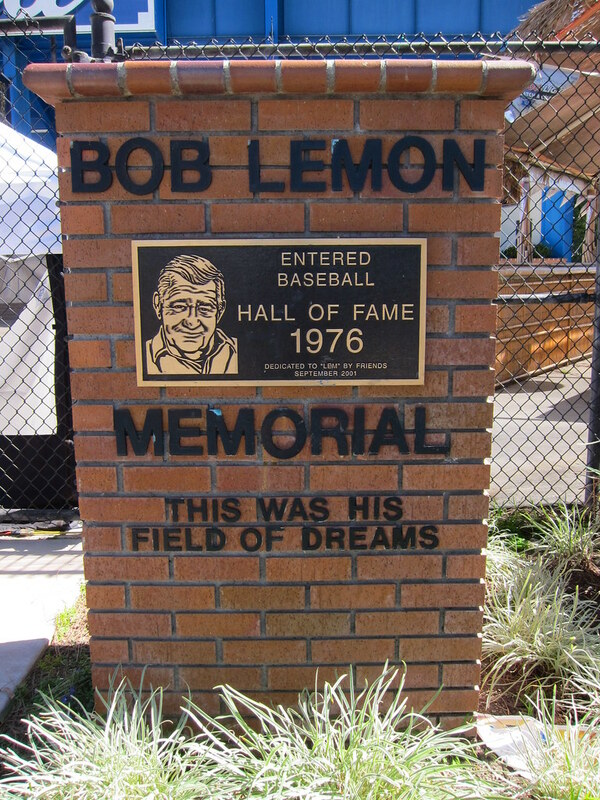 Bob Lemon attended the high school across the street from Blair Field, Wilson High School. He was a Major League Baseball player and coach and he was elected to the Baseball Hall of Fame in 1976. 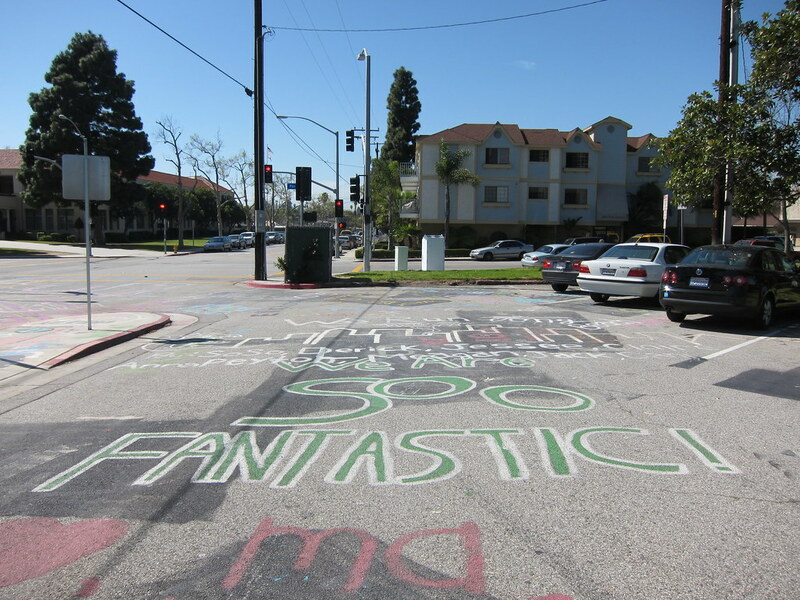 The surface of the Blair Field parking lot is covered with graffiti. I surmised the art was the work of Wilson High School students since I saw 'Class of 2010' scrawled across a few parking spots. Turns out the city of Long Beach sold the parking lot to the Long Beach Unified School District for Wilson High parking back in 1992. 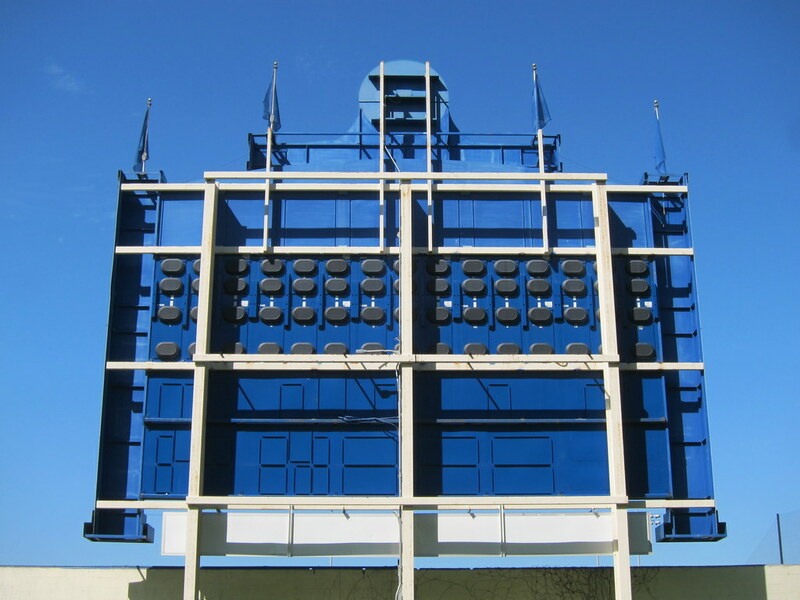 The revenue from the sale allowed Blair Field to replace worn wooden benches with aluminum ones, replace the roof, paint the entire facility, replace the backstop, upgrade the stadium sound system, reconstruct the playing surface, including a new drainage system, and install a new lighting system. I ran past the Long Beach State Dirtbags 2011 season schedule and stared up at the back of the electronic scoreboard at the backside of field. The Green Girl will not be doing the Inaugural San Diego Zoo Safari Half Marathon this weekend. Instead of a Running Green Girl, I will be a Working Green Girl to meet some crucial deadlines at work. I was really looking forward to running a safari race and I'm disappointed.